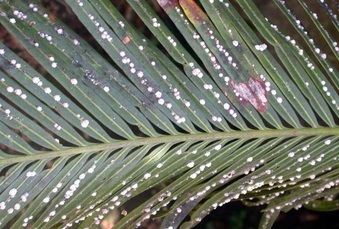 Cycad Aulacaspis Scale, also called Cycad Scale or Sago Scale, is a serious insect pest of sagos in central Florida. It attacks mainly King and Queen Sagos, but attacks other, rarer Cycads as well. This pest is very common in Central Florida, with the majority of King and Queen Sago plants having some degree of infestation. Compared to other scale insects that attack plants, this scale is much more aggressive. It multiplies very rapidly and leads to rapid leaf yellowing. In severe cases, the scale eventually kills the plant. On a positive note, this scale only infests sagos. Cycad Aulacaspis Scale nymphs (baby scale insects) are carried by wind from one sago to another. They are very small feed on the leaves, crown, trunk, roots, and seeds. The nymphs mature from tiny, translucent mobile insects, to white, stationary adult scale insects. Most homeowners first notice the scale as white "bumps" on the underside of the leaves. Left untreated, both sides of the leaves as well as the trunk quickly become infested. All Cycads, including sagos, are NOT palms! Over the years, we have experimented and tried many different insecticides and insect growth regulators (IGRs) for management of this scale. Through trial and error, we've been successful at maintaining this scale under control in the vast majority of cases. Luckily for us, we don't need to rely on insecticides alone to manage Cycad Aulacaspis Scale! 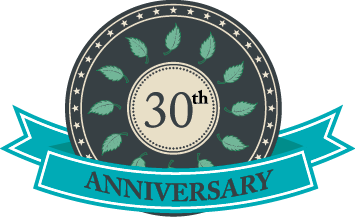 In 1997 & 1998, two biological control organisms - a predatory beetle and a parasitic wasp, were introducted to help manage this scale. 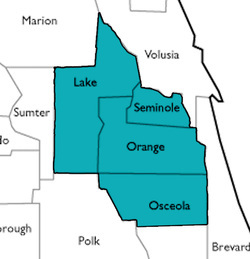 Both have been established in Central Florida for many years! If your Sago's leaves are heavily-infested by scale, remove and dispose of them away from the property. Unlike palm trees, it is ok to remove all the leaves from Sagos. When treating with insecticides, it is important to follow all label directions and achieve complete coverage including the top and bottom of the leaves and the trunk. To achieve better coverage, remove closely-spaced leaves. We recommend avoiding highly broad-spectrum insecticides (such as Malathion & Acephate) for treating of Cycad Aulacaspis Scale in an effort to preserve beneficial insects that help keep the scale under control.